The Olympics are just around the corner, and it's safe to say that I've got a healthy dose of rhythmic gymnastics in my system (ohh youtube, how I love thee). If I could, I'd walk around waving a ribbon into fun swirls all around my body. However, what has really got me super-amped and heel-clickin' is Gucci's 8 piece collection (called 8-8-2008, super catchy) for the Beijing 2008 Olympics. 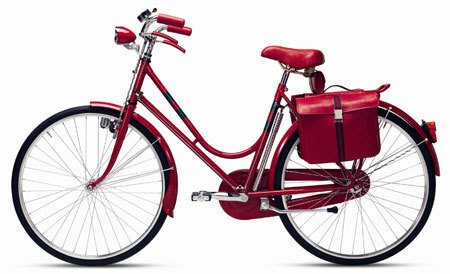 The bicycle had me drooling like a baby; I would not mind sitting my bum on that China red Gucci leather seat. Even the side messenger bag is chic beyond belief. But at $3,420, that will not be the next bike in my garage. *For those interested in the complete collection, and final prices, click here. 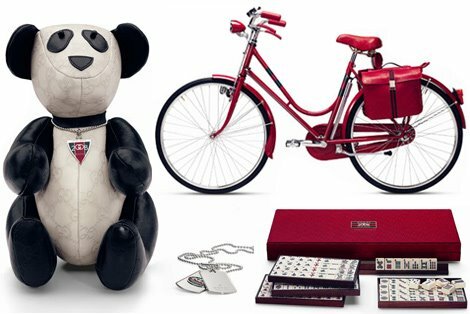 have you seen the chanel bike...madness. just sheer madness. Wow, what a cute bike! Love the red! that bike sure is something! I love your blog! That bike is perfect, as is your shopping list. I'll take all of the above please.